(Consumer Technology Show)’,the world’s largest IT exhibition, that will take place in Las Vegas, the USA from 9th to 12th of January. each media will select the TOP 3 through final screening and announce it officially on the last day of the exhibition. GAZE LAB is a smart lifestyle research centre that provides new experiences for users (UX). by combining emerging technologies that develop rapidly. 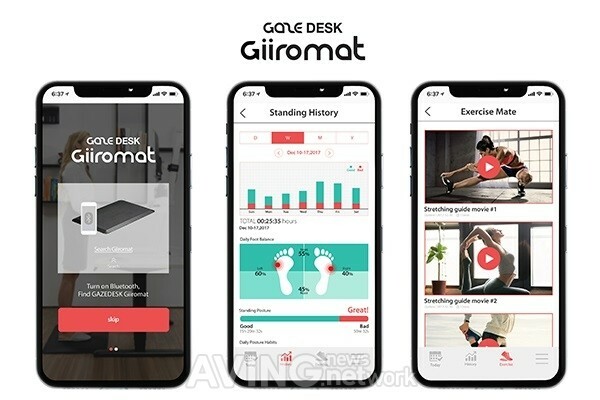 GAZE LAB’s products at CES this year are ‘GAZEDESK Workstation’ and ‘GiiroMat’. up and down through a touch controller in order to use the desk easily when they are either sitting on or standing. It is a compact workstation product that can be placed on an existing desk and used. will provide the more ergonomic working environment. loses its posture. ‘Giiro robot’, connected to its foot mat, moves its own leg or torso or changes its face whenever it changes its position. In other words, it will induce users to adjust their posture with gestures and LCD screens. This enables users to intuitively recognize the disorientationof the posture and to take the correct position. An official said, “we make a plan to show users new products that are more comfortable and healthy. We will try to be a leader in the field of smart standing furniture. held annually in January by the American Consumer Technology Association (CTA). reporting major issues in the world market and introduce Korea’s major companies all over the world.